Being both a budget traveler and someone who abhors committing to structured itineraries, I tend to avoid organized tours wherever I go. 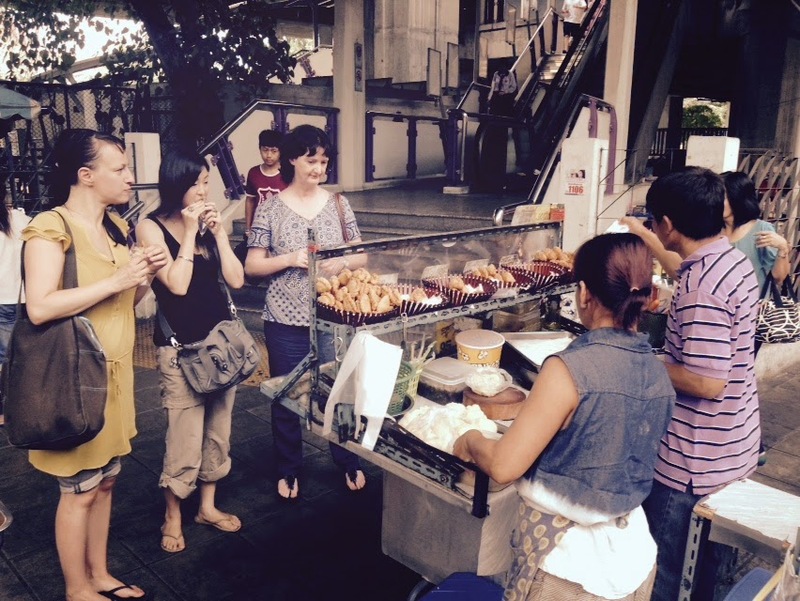 But I do love to take advantage of a good food tour on offer, especially in a city like Bangkok. 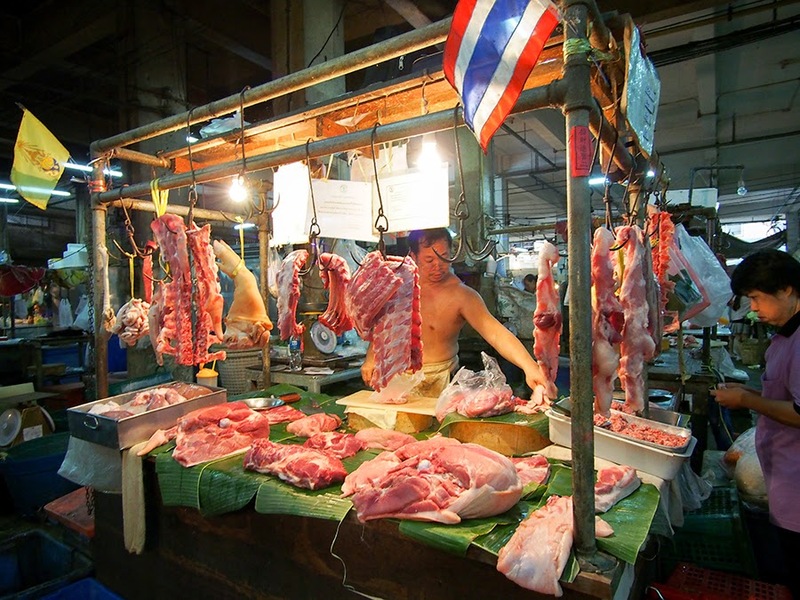 Like most Americans, I already knew a few things about Thai food before going into the tour. 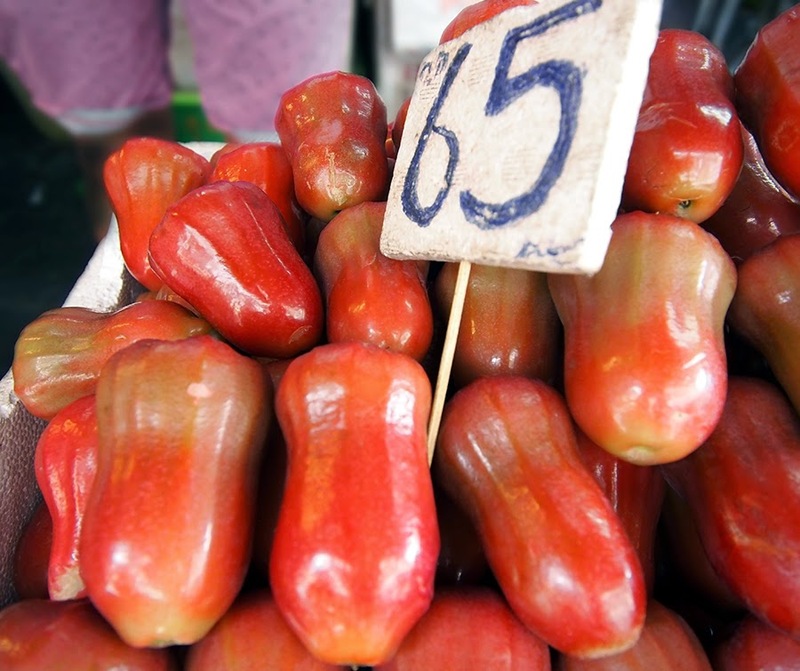 But also like most Americans, that knowledge didn't extend much beyond green papaya salad and Thai iced tea. So it was nice letting a local fill me up with a meal while getting a little more acquainted with this cuisine. And I highly recommend it to anyone else who might find themselves in this town full of deliciousness. 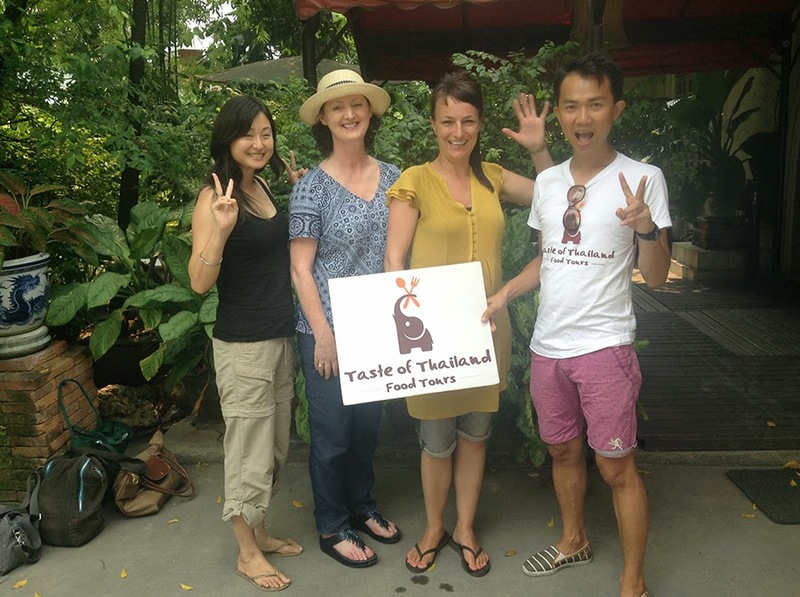 The first tour - because I ended up signing up for two different ones - was organized by a local, well-recommended company called Taste of Thailand. 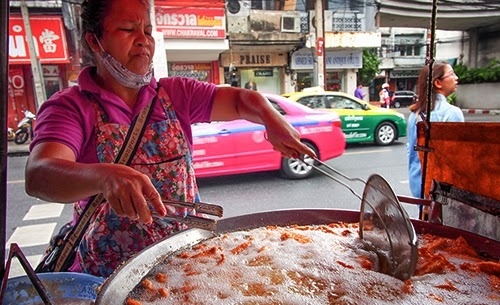 Walking through the "Village of Love" neighborhood, the tour offered us a large variety of eats from street fare to dishes traditionally made for Thai royalty. 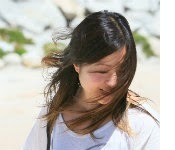 My tour guide, Thee, even took photos throughout, which I thought was hugely beneficial for the overall experience. Fried bananas and potatoes. This was probably my favorite stop on the tour. 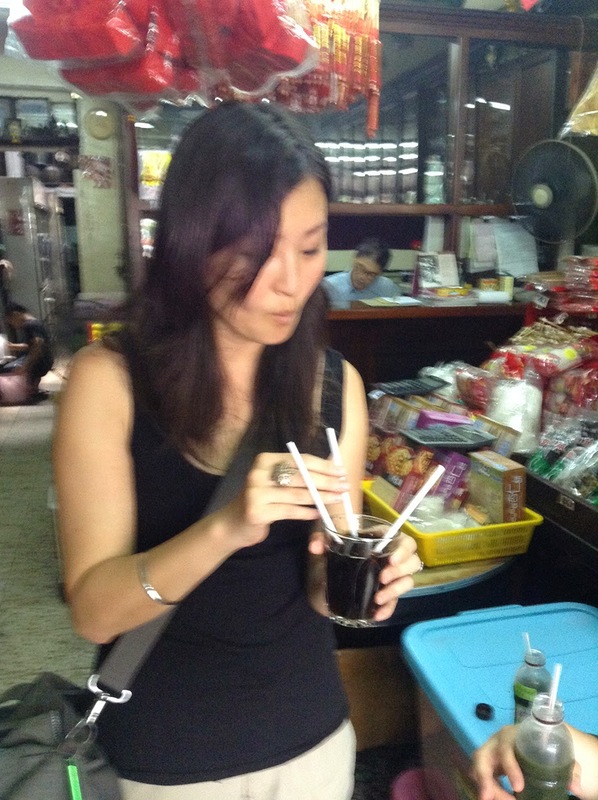 Sampling different Chinese medicinal teas; famous for their healing properties and infamous for their flavor. Eating curry puffs, an adaptation of both the Indian samosa and the English cornish pastry. 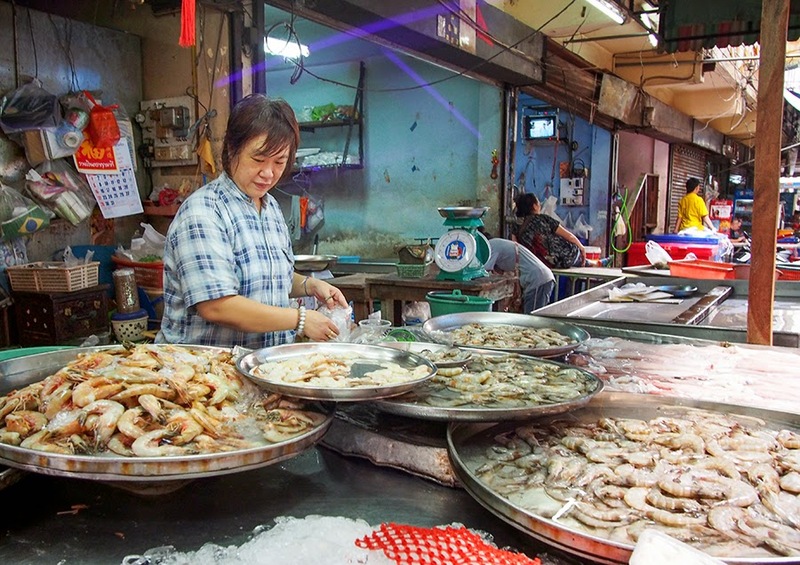 We even walked through a couple local markets so we could get that essential Asian food market photo op. We ended the tour with a group photo in which we were ordered to make Asian-style peace signs. Why am I the only attendee who complied? It took a day to recover from all that eating but once I did, I was ready for the next big meal. This time, I chose an international company I love to go back to called Urban Adventures and we walked through Chinatown. The main difference with this tour (other than that we mostly ate Chinese food) was that it mixed in traditional sight-seeing with the eating. So we kicked off at the Golden Buddha Temple where the tour guide, Wawa, schooled us on the history of Buddhism in Thailand. 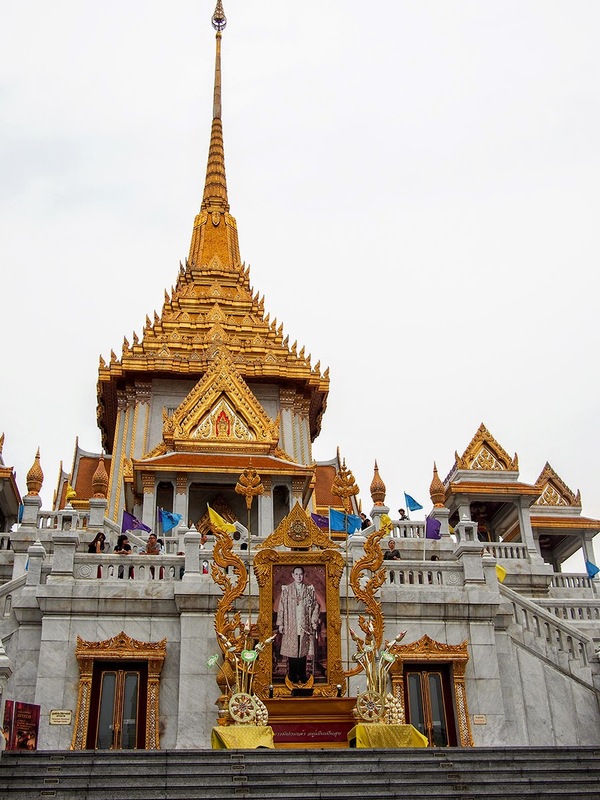 Among other interesting facts, I learned that while most Thais consider themselves Buddhist, they also worship many popular Hindu deities due to historical religious cross-pollination with India. 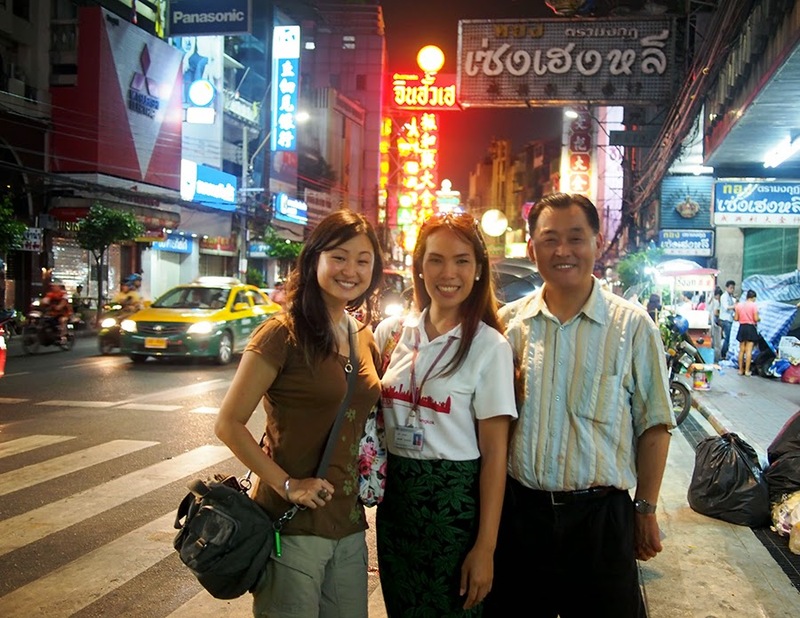 After a few temple stops, we walked down Yaowarat Road sampling Chinese street food all along the way. 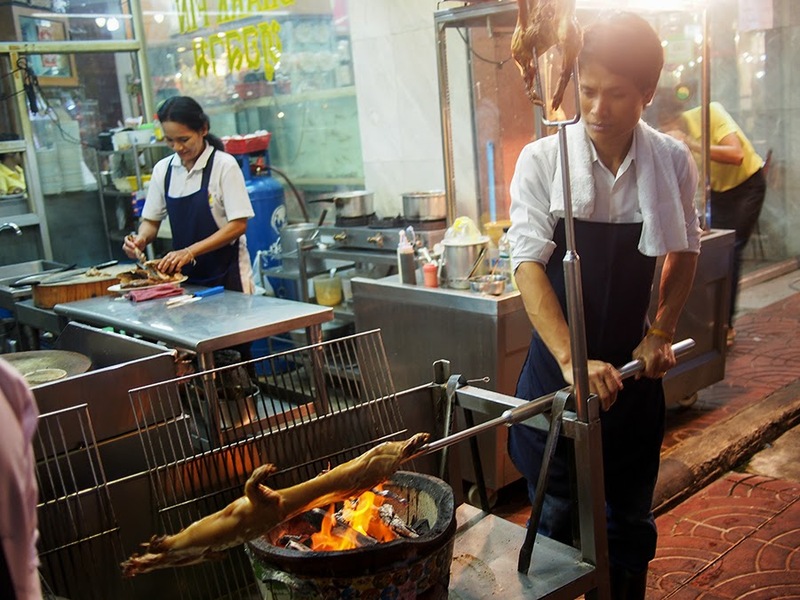 I always find it fascinating to watch how food is prepared. And less fascinating than heart-wretching was seeing how popular shark fin soup was around here. 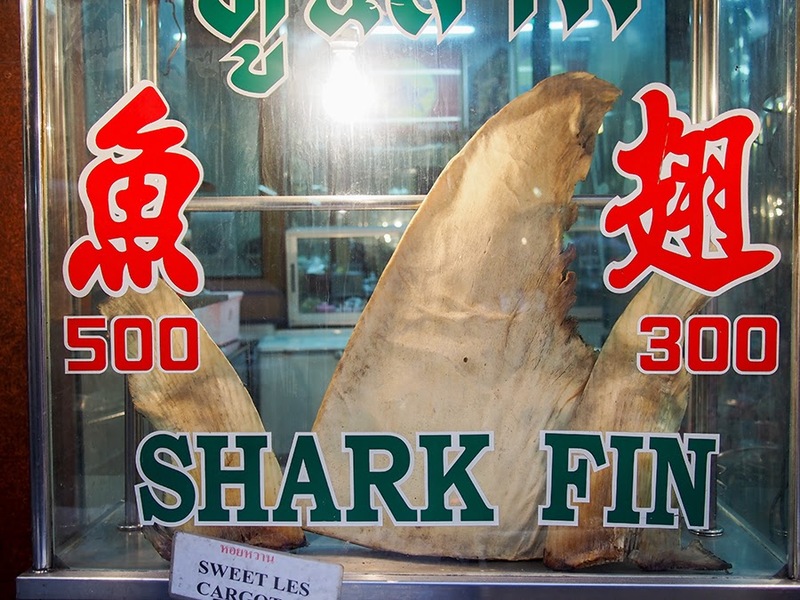 According to Fin Free Thailand, restaurant owners in Bangkok’s Chinatown claim to sell more than 20,000 bowls of shark fin soup per month. One of the cool things about this tour is it went into the night when the streets were abuzz with lights and life. We took one group photo to end the evening. It was a great experience overall from both tour companies. 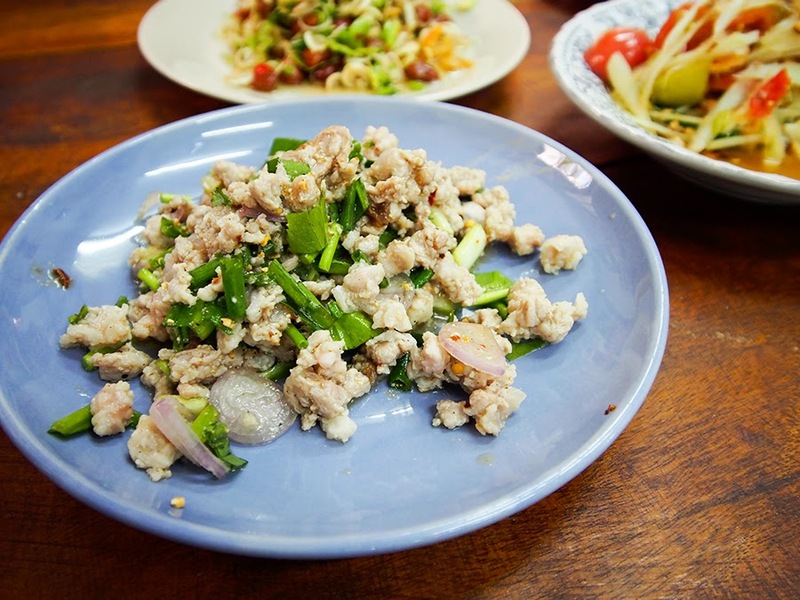 I got to learn a lot more about Thai cuisine as well as how the food and culture have been so influenced by other countries. 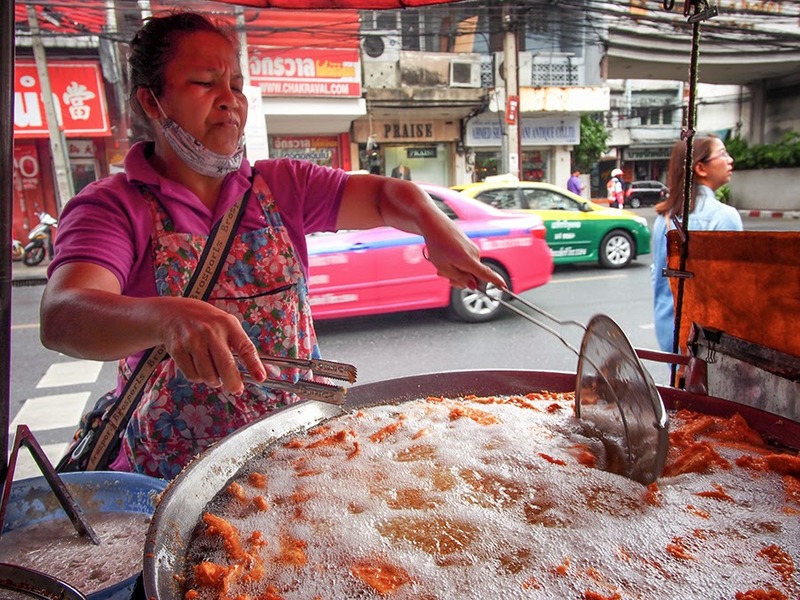 Hopefully this summary is helpful for anyone wondering what to expect on their next Bangkok food tour.